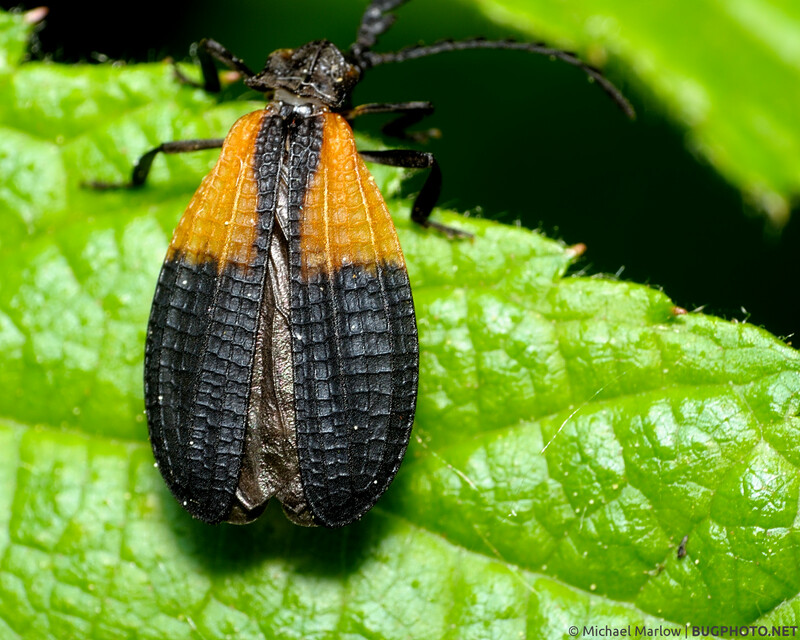 These distinctly-patterned elytra show where the net-winged beetle, family Lycidae, gets its name. 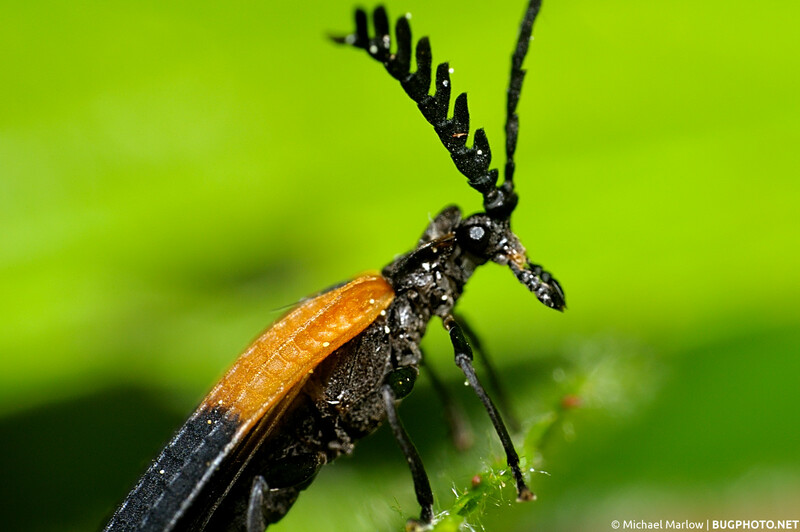 The net-winged beetle shown here is not what I would call a rare bug; they’re not ubiquitous like blow flies or hickory tussock moth caterpillars or bumblebees, but they show up reliably each year. They are however fairly wary and will not usually stick around for long. 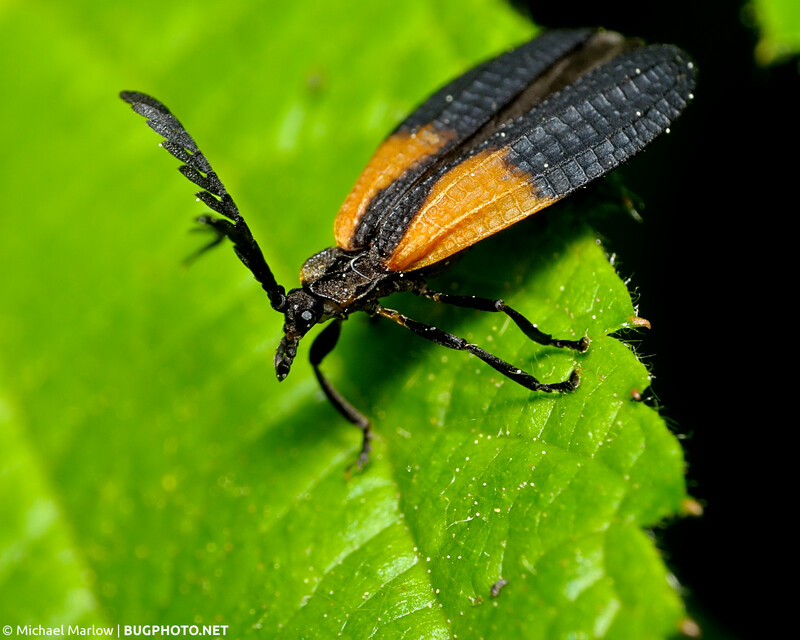 Their bodies, flat and matte, are unlike the typical beetle’s shiny and round forms. In that way they are a bit more like a moth (though the lack of scales and lack of a proboscis strongly distinguish them), and so they present “mothly” challenges: from the top it is necessary to hold the camera precisely parallel to the elytra (wing covers) to get good focus; in profile it is difficult to get a large part of the insect in focus – further exacerbated in this case because the net-winged beetle tends to have a very tiny head out of proportion to its elytra. I was glad this one stuck around for a short while – enough to snap a handful of shots – but it was hard to get what I wanted. In the first shot above, which is probably my favorite of the three, I was able to get very good focus on the elytra and wings but the left antenna was cut off; I think it diminishes the moment of the beetle looking over and under the leaf. Still I like it. The second shot has pretty good focus, too, and is a “solid” shot, but there’s not a lot going on there. In the final shot at the bottom of this post, I went in for the “bug portrait,” but unfortunately the little twitchy only stood still for one shot. And I missed it. I used layer masking to do some selective, let’s call it “oversharpening,” on the head area, but it was too far out of focus. In the end, these are some of the scarce shots of net-winged beetles that I have, so I’m taking them! This net-winged beetle was moving around enough to make it difficult to get shots, but at least it wasn’t flying off immediately! Sometimes you don’t quite get it: in the end the net-winged beetle was just a little too fidgety to get a super-close shot in focus. Posted in ColeopteraTagged beetle, elytra, focus, Lycidae, net-winged beetle, not a moth, out of focus, pattern, take your shotBookmark the permalink. You’re right about the head…it’s tiny compared to the wings. Still you were able to get it in focus especially well on the middle shot.